With how much TechCrunch and other tech publications cover incubators and accelerators in Silicon Valley and in the U.S., it’s refreshing to occasionally get a glimpse of what’s happening outside North America, especially those places where startup incubation and entrepreneurial activity is on the rise. One such example is a relatively new startup accelerator and seed fund called SeedStartup, which makes its home in Dubai, UAE. SeedStartup focuses on digital media startups, selecting 5 to 10 companies to participate in its 3-month program. Those selected receive $20K to $25K in exchange for 10 percent equity, access to a global list of mentors, as well as networking, and introductions to investors. While SeedStartup accepts applications from businesses all over the world, it tends to home in on companies that hail from MENA (Middle East, North Africa), and requires its chosen founders to live in Dubai for the duration of the program. The Next Web did a round-up on the accelerator’s first batch of three companies, which you can check out here. 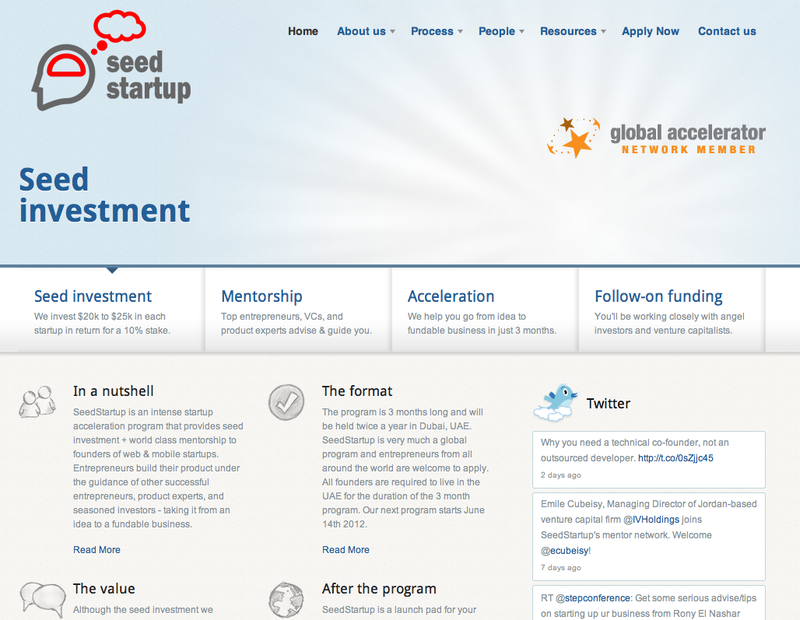 SeedStartup’s next program will begin on June 14th, with the application deadline being May 3rd. Since launching, the accelerator has become part of TechStars’ Global Accelerator Network. SeedStartup was founded by Rony El Nashar (who is also a managing partner), a United States-educated entrepreneur and investor who founded startups in the U.S. before moving back to the UAE to help grow the local entrepreneurial ecosystem, working with a local seed fund before starting his own accelerator. Rony is dedicated to finding and cultivating tech talent in the Middle East, which he says has seen an explosion of entrepreneurial enthusiasm over the last year. This was also recently evidenced by TC’s own Mike Butcher traveling to Beirut at the end of March for the ArabNet Digital Summit in Beirut, Lebanon. Mike said that ArabNet has become the largest digital event in the region, and this year expanded to 5 days, a startup competition, workshops, included 1,500 delegates — and even a hackathon. As the Web and web-based business spreads across MENA, Rony has been looking to find ways to fund Middle Eastern entrepreneurs, who still today, in spite of events like ArabNet, have limited seed investment resources for startups. While SeedStartup was designed to begin to address the lack of funding and mentoring, the process starts with education. Especially education from the brightest minds and leaders in the tech sphere — as they are the people that can help get would-be founders excited about taking the entrepreneurial leap of faith. To aid in that endeavor, Rony recently launched a side project called Cofounder TV, which is meant to be an educational resource for international entrepreneurs — specifically in the form of video. Yes, the site is essentially a curated library of some of the Web’s best entrepreneurial content, designed to enable users to learn from founders, investors, and thought leaders. “The goal is to educate and inspire,” Rony tells us. The site is organized into categories, on a variety of different subjects, and offers quick search of its database. 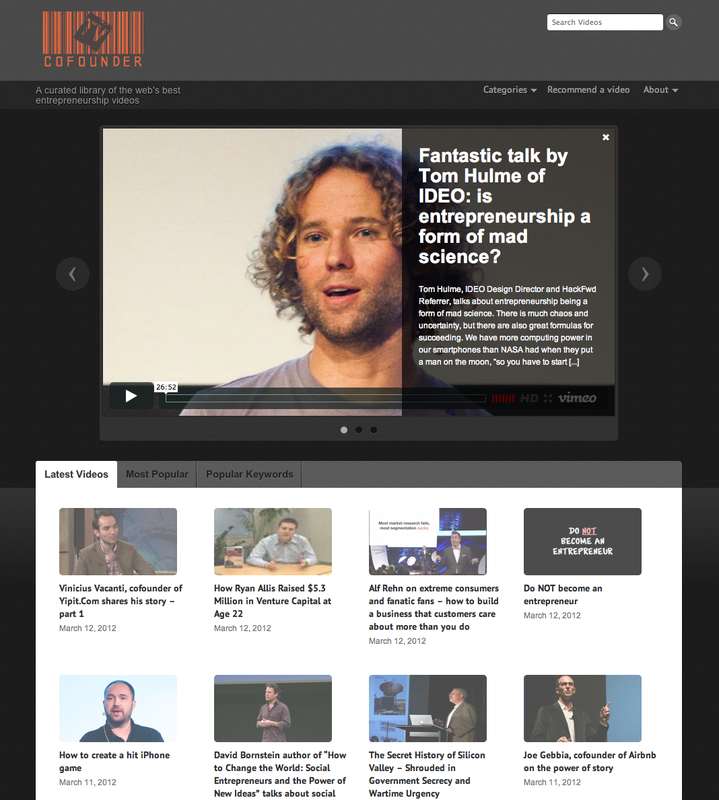 It’s like an entrepreneurial YouTube for MENA, or Khan Academy for startups. Obviously, there are quite a few other alternatives, other sites that seek to offer entrepreneurs educational opportunities via video, like BizMixx, or there’s Grovo’s Expert Series, Now I Know, and the awesome Mixergy — to name a few. But, as to Co-founder TV, Rony tells us that the website has been received very well by publications from Latin America to China, with Asia constituting over 32 percent of the site’s traffic. Cofounder TV is by no means the only video-based entrepreneurial vehicle on the Web, but it’s great to see a connection between the interest in the video resource and the rise of the UAE and MENA as an increasingly sophisticated entrepreneurial hub. For more, check out SeedStartup here and Cofounder TV here.